We are always falling. The act of walking is nothing more than a carefully orchestrated falling forward, as is obvious when you watch a child take her first steps. Perhaps this is what drew Kelcey Parker to Frank Lloyd Wright’s Fallingwater house as the setting for her story–a house that is caught in the constant act of falling. Liliane’s Balcony, a novella of Fallingwater, by Kelcey Parker, is inspired by Frank Lloyd Wright’s famous house in rural Pennsylvania; in it, Parker seeks to translate Wright’s architecture into written form. What if a house were a novel, she seems to ask. An interesting question, but one that sounds, at first, unlikely to lead to a particularly readable novel. This is where Parker surprises. Liliane’s Balcony combines a potentially esoteric idea with a very moving and human cast of characters to create a novel that draws you into its world and keeps you comfortably inside. As a novella in flash, Liliane’s Balcony works like several novels rolled into one. At the foundation of the narrative is Liliane Kaufmann, wife of Pittsburgh merchant E.J. Kaufmann, who commissioned Fallingwater from Wright in 1935. In 1952, Liliane overdosed on pain pills in her bedroom at the house, and this is where the narrative starts–with Liliane on the famous cantilevered balcony. The history of the unhappy marriage between Liliane and Edgar unfolds slowly, while in the present modern-day tourists carry their own stories with them as they move through the house and encounter its ghosts. In short passages switching between multiple points of view, including that of Frank Lloyd Wright and Ahi Opilhele–the spirit of the river itself, the characters come to full and vivid life. This is the accomplishment that holds the novella together and keeps it from teetering over the edge into just an interesting exercise in craft. The people and their stories lift the precarious structure of the narrative up. Like Liliane’s balcony, you find yourself wondering how it manages to float so beautifully in space. The narrative voices of the present day visitors to Fallingwater vary in tone and content. A married couple contemplates childlessness. A young woman who has lost her father reflects on a bad relationship. A young girl is convinced there are ghosts in the house and finds she may be right. Among my favorite of these narratives in the present is the motorcyclist, Josiah Quimby, who is introduced with the line, “Josiah Quimby is a man of high culture and Harley-Davidsons.” Quimby is the kind of character who could easily slip into stereotypes and cliches, but doesn’t. We learn that he is in love with a tiny woman named Rini, whom he met at a bar, and in just a few sentences Parker paints a perfect story for their courtship. The most interesting and complicated relationship in the book is that of Liliane and Edgar Kaufmann. The two were first cousins from a wealthy family who owned department stores in Pittsburgh, and though Liliane told the press her marriage had nothing to do with love, Parker imagines this as a lie. They lived in a house that was famous even within their lifetimes, but in the story of their relationship, they become as ordinary as the rest of us–two people trying to solve the torturous puzzle of how to love each other. Parker repeats throughout the book a line from one of Edgar Kaufman’s letters to Liliane, “Love the kind you long for.” The line echoes through the novella like the sound of the falling water itself and leaves the reader wondering, what is that kind of love? In several places in the novel, Liliane remembers a poem by Goethe, Gesang dur Geister über den Wassern, or Song of the Spirits over the Waters. The poem begins, “The soul of man / Is like the water: / It comes from heaven, / It returns to heaven, / And down again / To earth must go / Ever changing.” Having read the poem as a young girl, Liliane sees it as a sign that she was destined for Fallingwater–that she was falling towards it all along. In the present day, there is the sense that these characters, too, are falling towards the house. If one of the purposes of art is to freeze a moment in time, then this is what both Parker and Wright accomplish in the novella and the house; they preserve a perfect moment in our constant free-fall. Robyn Ryle started life in one small town and ended up in another just down the river. She teaches sociology to college students when she=s not writing and has stories at Bartleby Snopes, WhiskeyPaper, Cease, Cows and Pea River Journal, among others. You can find her on Twitter, @RobynRyle. 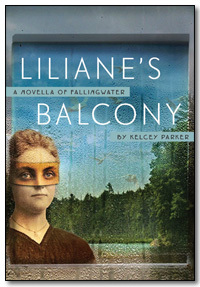 Liliane’s Balcony is Kelcey Parker’s first novel. Her short story collection, For Sale by Owner (Kore Press) won the 2011 Next Generation Indie Book Award in Short Fiction and was a finalist for the 2012 Best Books of Indiana in Fiction. She is the recipient of an Individual Artist’s Grant from the Indiana Arts Commission and a Promise Award from the Sustainable Arts Foundation. Her stories have appeared in numerous literary journals including Notre Dame Review, Bellingham Review, Santa Monica Review, Indiana Review, Third Coast, Redivider, Western Humanities Review, and Image. She has a Ph.D. from the University of Cincinnati and currently directs the creative writing program at Indiana University South Bend. Oddly enough, Long Nights by Eddie Vedder was playing while I read this. I’d love to read this novella. Thanks for this review. Robyn, thanks for this thoughtful and insightful review of my book!